One last post about my Vermont weekend. Sunday morning it was still freezing cold. I had planned for us to go snowshoeing but I was being a baby—8 degrees at 10 am is just too cold to be outside. 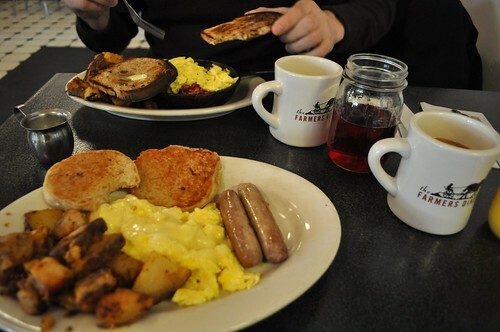 We headed over to The Farmer’s Diner for breakfast. I was totally impressed with their homemade english muffins. I would love to try making my own. Next to the diner is a Cabot cheese store and Antique mall. I sampled a few cheeses but it was hard to get them down because I was so stuffed from breakfast. Greg kept telling how disgusting I was for even trying to fit anything else in my belly. But it was cheese and I love cheese. We poked through the hundreds of booths admiring all the treasures. I was amazed how patient Greg was being. I didn’t really find anything I needed but I did snap a few photos. So many perfect still-life compositions. I am glad yo enjoyed your visit to the VT Antique Mall. I hope you come back again. We just opened the Toy Museum for free to the public and Yankee Magazine gave us Best in New England! I’ve heard of Farmer’s Diner! Sounds deliciously fantastic. Love your photos of your adventures lately! I grew up in VT === this makes me miss it even more than usual!!! 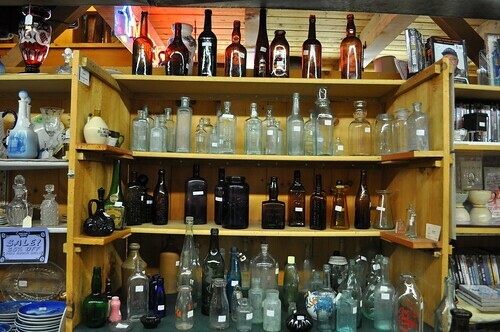 I want ALL of those vintage bottles and ALL of those Tom Sawyer books! I grew up in the Upper Valley and love all that you shared from your trip there! I live in Boston now and every so often crave all those Vermont things . . . browsing small stores, simon pearce, the delicious diners. Just happened across your blog today, love what you’re doing! Thanks for sharing. I love the antique mall! Vermont is one of the most beautiful states that I have ever seen! We stayed at the Woodstock Inn which is in the village of Woodstock. Great location because we could browse the shops in town and walk to restaurants. Very lovely. We got a room with a fireplace. your weekend in vermont sounds/looks amazing. i’ve been dying to go to that diner after reading about it in gourmet i think like 5 years ago. i spent all my winter weekends in vermont as a kid but sadly my mom sold our house a few years ago. wondering – where did you stay? can you recommend someplace cute? What a fun morning! 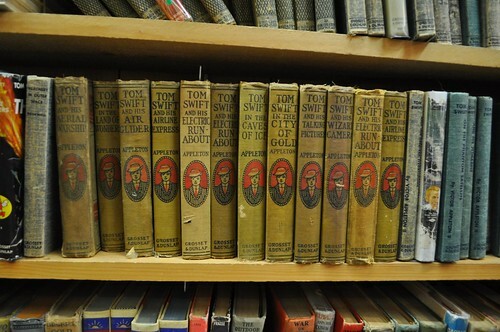 I love those vintage books. Such a pretty little collection. My mother made her own english muffins. I didn’t taste a “store bought” muffin till I went away to college. Now I want to make them too. Hope you’ll post a recipe. Oh man, I only spent one year in the Upper Valley but these posts make me “homesick”! 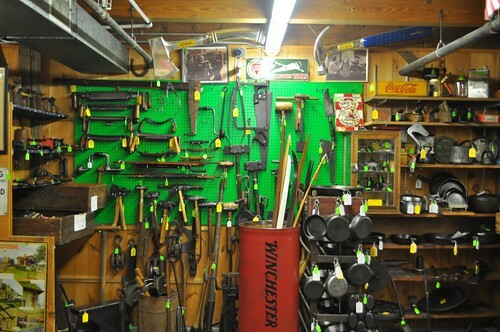 That tool booth in the antique mall hasn’t changed a bit in the 4-5 years I’ve been wandering around there. All of my New Year’s resolutions last year were related to learning to cook certain things, english muffins, bagels and croissants among them. (I guess there was a breakfast theme?) I failed to achieve either resolution, so they’ve moved onto this year’s list. If you tackle them, please post the results! This looks like a perfect way to spend a weekend! My parents went to the Farmer’s Diner and gifted me those mugs. Drink my morning coffee out of them each day and I love the sayings on the back.